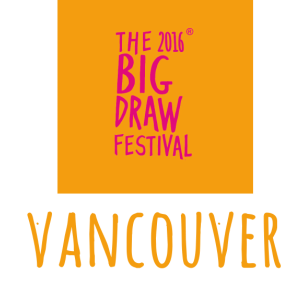 The Vancouver Draw Down Online Daily Drawing Challenge is precisely that — a challenge from Vancouver Draw Down for you to draw every day. The seven-day Online Daily Drawing Challenge is designed to get your imagination and ink flowing in preparation of the 2014 Vancouver Draw Down free artist-led workshops on June 14. From June 7 to 13, the Online Drawing Challenge instructions are posted each day here, on Facebook, and on Twitter. Choose between the 'Just For Fun' instructions (five-minute drawings) or 'Challenge' instructions (15-minute drawings). Draw 25 dots on a page and connect some or all of the dots. Transform an existing image from a magazine or newspaper by drawing on top of it. Post photos or scans of drawings to the Vancouver Draw Down Facebook, Twitter and Instagram. Don't forget to tag your photos: @VanDrawDown #DrawDown #DailyDrawing.